TPF sponsored ₹ 2,00,000 for Prof. MVS Koteswara Rao Memorial High School, Adavi Takkellapadu, Guntur. 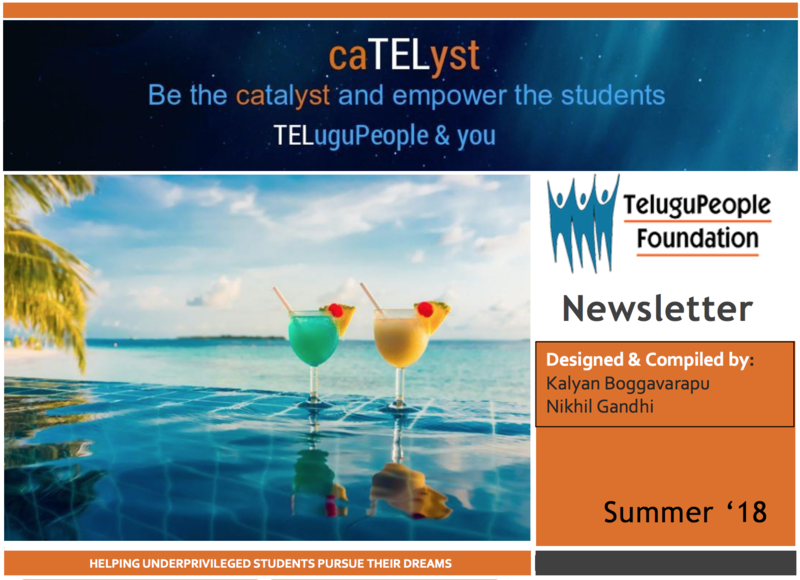 TPF is pleased to sponsor ₹ 2,00,000 towards construction of one classroom in Prof. MVS Koteswara Rao Memorial High School, Adavi Takkellapadu, Guntur. 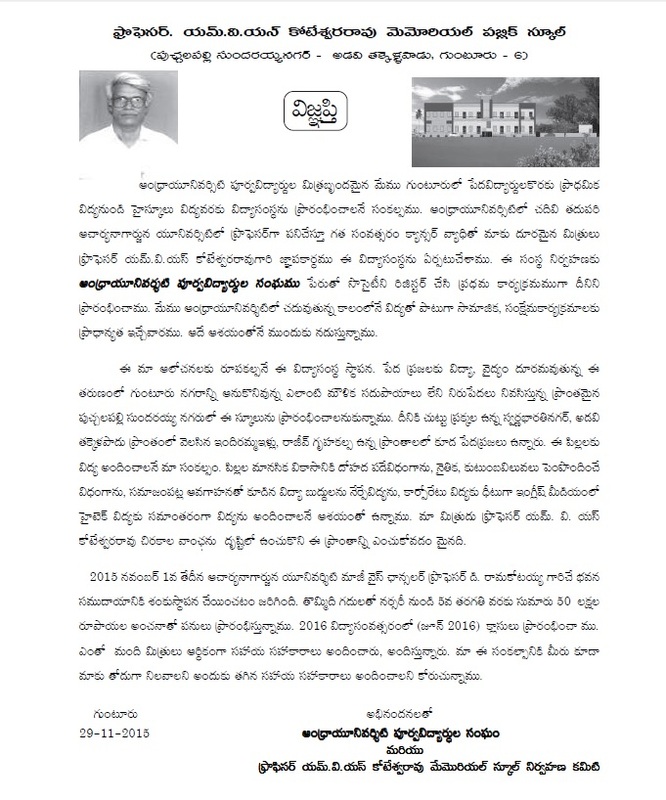 Prof. MVS Koteswara Rao garu served as Head of Political Sciences and Administration at Acharya Nagarjuna University. Prof. Rao garu had a vision to educate the poor and actively worked towards this cause throughout his life time. He had a dream of building a school for children from the poor neighborhoods of Adavi Takkellapadu village, Guntur. Before his dream shaped in to reality, he passed away due to ill health. 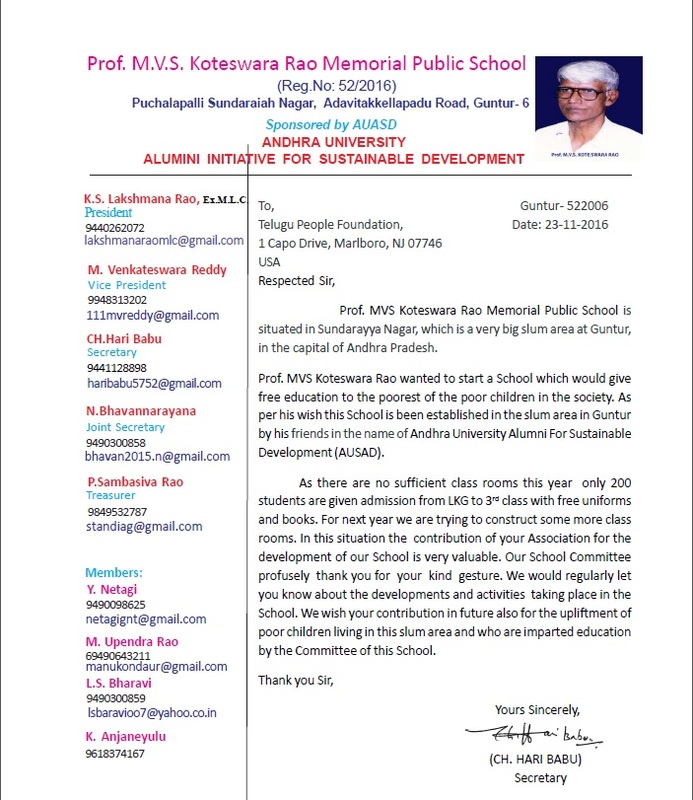 Friends of Prof. Rao established Andhra University Alumni association for Sustainable Development (AUASD) and took upon the noble task of fulfilling his dream. The association aims to design curriculum that will promote psychological development, ethical and family values, and social awareness in children and will prepare students to compete with corporate schools. The association plans to build 6 classrooms to conduct classes from kindergarten to 5th grade and is looking for donors for contributions. 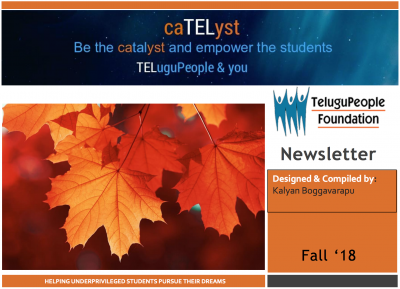 Pedababu garu of New Jersey kindly offered to sponsor for one classroom and donated $1500 through TeluguPeople Foundation. With his employer, Bank of America, matching his donation, the total of ₹ 2,00,000 was transferred to the school’s bank account in October. We thank Pedababu garu for his kind donation. The school is still looking for donations to complete the project. We request donors to come forward and donate generously to sponsor a whole class room or to the pool to fulfill sundry construction expenses. 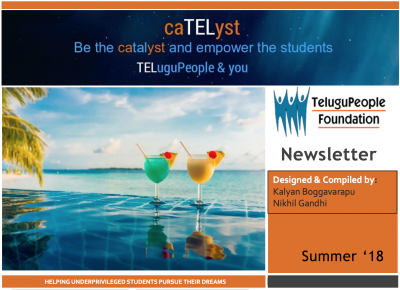 If you are interested to sponsor, Please reach out to us at Treasurer@TeluguPeople.Org. We thank Pedababu garu and his family members for their kind donation.